A NEW documentary film featuring a popular community worker and McGurk’s Bar campaigner has been named as ‘Best Debut’ at the Netherlands Film Festival. ‘When the War Ends’ which features Robert McClenaghan is directed by Dutch filmmaker Thijs Schreuder and was shot in and around west Belfast in the run-up to Christmas last year. It examines how local people have coped with the legacy of the Troubles after the conflict ended. The film was given an exclusive screening in the Felons club recently to a rapturous response and will be shown as part of next year’s Belfast Film Festival. Speaking to the Belfast Media Group Thijs said he initially came to Belfast to film a different type of documentary. “I wanted to do something on how the borders of Europe were disappearing yet new borders were appearing within countries,” said Thijs. 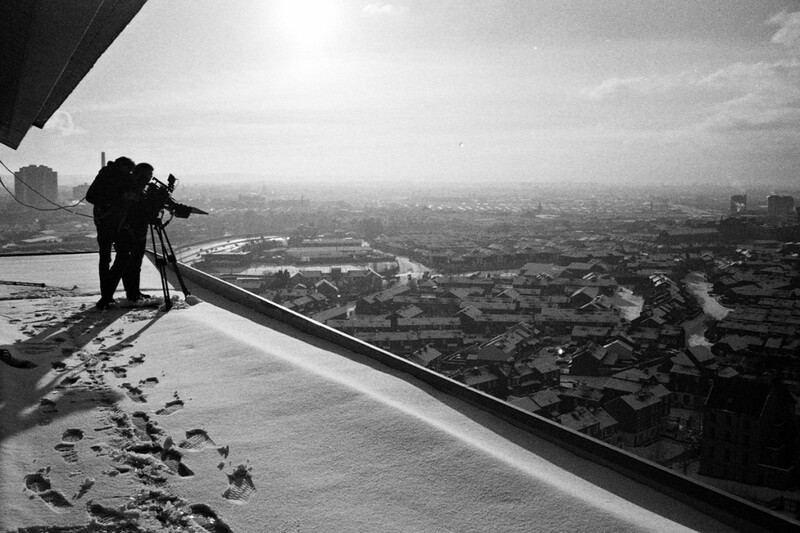 Thijs and his crew were filming around Belfast when the area was covered in heavy snow. He chose to focus on Robert McClenaghan, whose grandfather Phillip Garry was murdered in the McGurk’s Bar bombing and who also works as a guide for Coiste’s political tours, as he felt viewers “would connect with him”. “The story also has to be understood by an international audience not familiar with the conflict here so I knew people would connect with Robert,” said Thijs. Thijs said the film received a very positive reaction when shown in the Felons. “There was one scene when Robert is sitting on a chair at home reflecting on his past and this person came up to me after the screening and said, ‘I was that man sitting on that chair and I recognise that feeling. I am stuck in that chair and it’s good to see that I am not alone’. Speaking about his involvement in the film, Robert said he saw it as a opportunity “to explain to a wider audience how our politics and our community developed from the conflict”. “They started following the tours and then they would ask the guides questions about the tour group and how it came about,” said Robert. Robert said he’s pleased with how the film turned out.